Info: Peated to 208ppm and 5 years old. Travel Retail (i.e. airports). Limited edition cuvee that marries spirit matured in classic American oak with spirit matured in casks that once held Syrah created in the great vineyards of the northern Rhone valley. 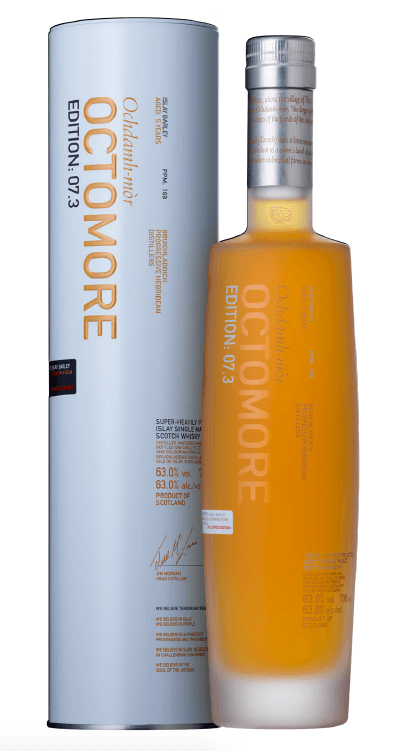 Nose: Octomore, but with a twist, has it been tamed?! There’s malt, lots of mossy peat and smouldering wood char, but it’s possibly less in your face than you might expect, it’s checked by the sweeter influences from the Syrah casks which seem to helped balance it out perfectly into a nice rounded peaty dram. Palate: Rich, thick and oily on your palate, but also really easy to take at full strength without overloading your palate. The mossy peat nature comes first, followed by building pepper spices, but all balanced out by a nearly fizzy sweet nature from the wine finish which works a treat. Finish: Long, sweet and peaty… it’s got raw energy to enjoy and lasts out for a long time… Rich earthy grapes eaten on a beach with a sea breeze. Yum. Water: Doesn’t really need it… but if you do it releases a slight rubber note, some of the engine oil favours that Octomore is sometimes known for. It becomes easier to drink due to alcohol reduction, but keeps its oiliness. The ember smoke is increased, and peat moss decreased a little maybe, with the embers remaining on the nice long finish, great stuff. Thoughts: Is this my favourite Octomore yet? Very possibly I think, yes! Available: Travel Retail… if you find it then you’re a lucky person and you should grab it. Extra: Plenty of other previous Octomore reviews on SWB here and here. 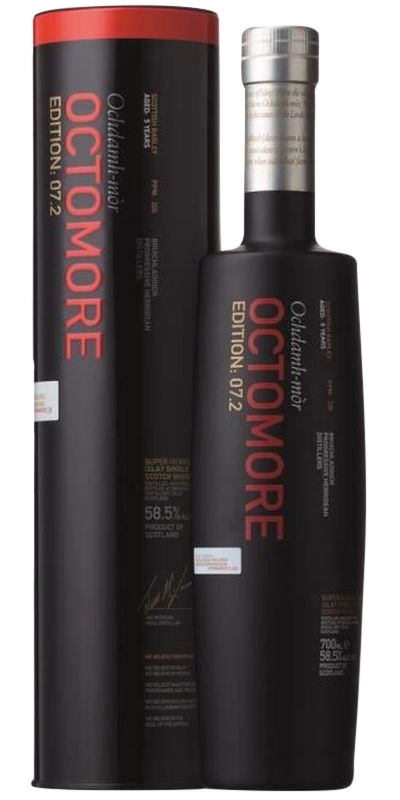 Info: Octomore whisky made from barley grown two miles along the coast from the distillery at farmer James Brown’s Octomore farm. 169PPM. Matured in American bourbon barrels and Spanish wine casks of Ribera del Duero. Colour: Early evening sunny gold, hints of red. Nose: It’s Octomore for sure, but what hits me first is a real creaminess. With a bit of time the smoke (more than peat) starts to jump out of your glass. I think it’d be fair to say that at 63% a drop of water would probably open it up more. We’ll come to that. That said, with a gentle warm in your hand there’s oodles of flavour, lead by a real fruitiness; red berries and vanilla cream all interlaced with peat, coal and smoke. After time a hint of BBQ bacon starts to come out, creamy smoked bacon. Palate: Thick oils cover your tongue with a creamy warming smoked malt. It’s sweet and full of summer and winter berries, and is much more approachable on your tongue than you might expect for the high alcohol volume. Finish: Burning smoke embers carry on for ages in your mouth while your chest is given a very warming big hug. Hints of oak at the end which flirt with the peat. There’s a really fresh and zingy top note, slightly minty or eucalyptus feeling, it’s good fun. Water: I’m at the point of my whisky drinking where I openly admit to watering down cask strength drams, it’s not a show of manliness to drink them neat. For me often my tongue can be anesthetized if the ABV is too high and then the enjoyment of the whisky is lower. That said, this dram appears to be one I can drink at 63% and still fully enjoy, it’s a cracker. However, let’s pop a bit of water in anyway… on the nose there’s more in the way of grassy barley, with big clods of peaty moss thrown in. It’s even smoother in your mouth, you can hold it for ages with no prob. The finish stays sweetly fresh and fruity with embers. Thoughts: Immensely likable, creamy Octomore, it continues to go from strength to strength! The extra sweetness from the Spanish wine casks really works a treat, it’s properly good stuff which works perfectly as the weather outside is cooling down. Thanks to Bruichladdich for the samples! This entry was posted in Review, Whisky and tagged Octomore. Bookmark the permalink.